Beware: Edalie - "Artists Beware"
WHEN: Commission was paid for on April 11th. EXPLAIN: In April, I came into contact with Edalie. She had been posting her art in a discord server I frequent at a steady pace. After noting her quality and ability to draw different styles, I asked her for a commission. A character design sheet, with three total drawings, all shaded, and 6 total facial expressions. She charged me $290 USD for the transaction. It was pricey, but I could afford it at the time. On May 21st, I received lineart for the first pose. Simple enough. It was colored the next day. We would go about a week's worth of silence, before more contact on June 6th. She promised that she would get me a sketch of the second pose by the next day. It did not come by the next day. In fact, it wouldn't arrive for two whole months, during which contact was very scarce and was almost always initiated by me engaging in small talk every now and then. In early August, I finally received the sketches promised. And then more silence. On August 23rd, I was told that she would be streaming this commission on her Twitch channel, and she asked me if she was okay to begin working on lineart. To the best of my knowledge, this stream did not happen. I tuned in briefly and she was not working on my commission at all. However, she has past broadcasts turned off, so I have no real way of verifying this. I have reason to believe she did not work on my commission at all, however, because the next update I received from her would just be a revised sketch and not the lineart I was promised. A full month passed, and on September 24th, I messaged her again, this time with a pretty passive aggressive message. She responded and apologized, stating that she had accepted other commissions, and had given them priority. Her reasoning for this was because I didn't ask for a deadline. She asked for a chance to make it up by working on the commission all day. At the time, I accepted it. However, I sought counsel from friends, some of whom are also artists, and they understood my concerns. Mainly that I felt like it was unfair for my commission to just not be worked on even though I paid for a spot in the queue. 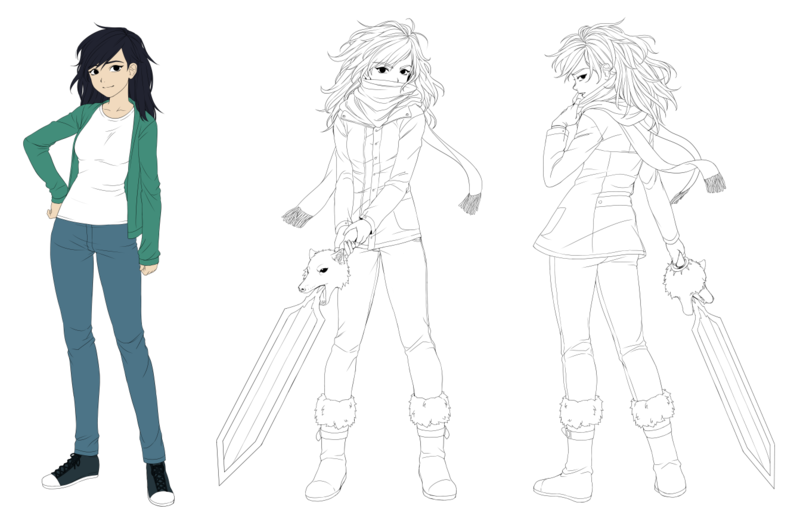 Following our exchange, she finally got the lineart to me (mind you, this was supposed to be completed in August). I began to ask her for revisions, but instead I decided that it was best we called it off. I felt like it would be enabling that kind of behavior if I let her continue to work on the commission with no accountability, as she had already shown me that she was likely not going to give my commission priority if other commissions came in, despite the fact that it had been five months since I paid for it. After asking for a refund, she became very combative, initially saying that 2 months is the average turnaround for a commission based on what other artists have told her. She also tried to insinuate that because I was patient, that I was okay with being pushed back constantly due to her prioritizing other commissions paid for after mine. I told her I felt that the art I was going to be given in only hours would not match the quality I would expect for a $290 payment, and also due to how long it took for us to get to that point. She seemed to think that my issue was with the quality of the art and the price, not with how long it took for me to get lineart for the sketch. After a little bit more of back and forth (screenshots of the full discord conversation from the time of payment to the end will be provided) she agreed to calculate the refund price. I reasoned that the refund would be around $170 to $190 due to the fact that only one out of 3 poses had been colored, lineart for the other two poses had been finished that day, and nothing had been shaded. Her refund amount was $80. She tried to justify it saying that her prices at the time were $70 for lineart ($100 now, apparently). I agreed without thinking about it at the time, but upon further review of our logs, there was no such price specified at all. She also mentions a discount on cell shaded fullbodies. That was also not in our agreement. We go back and forth a little more, and our logs end with her telling me that after our conversation, she will be instating a no refunds policy and that it's based on her own kindness not to enforce that on me. I have since attempted to go through PayPal for a chargeback, and am currently trying to get half of the agreed amount back, as I do not feel like she should keep $210 for less than half of the work. "Hi @everyone! This post is a warning of a recent commissioner. When doing business with someone, it's never wise to be fickle and change things unless the other party agrees. It can cause confusion, and a hassle for both sides. When you give money to someone for a service, you are forming a business relationship. A successful business is all about the satisfaction of both ends, and the responsibility of the commissioner matters just as much as the Artist's. Feelings must be mutual so the Artist can happily receive their payment, while the commissioner can happily receive their product. The safety of the Artist is just as important as well, so the commissioners that disrespect, and mistreat the Artist will result in being Blacklisted. 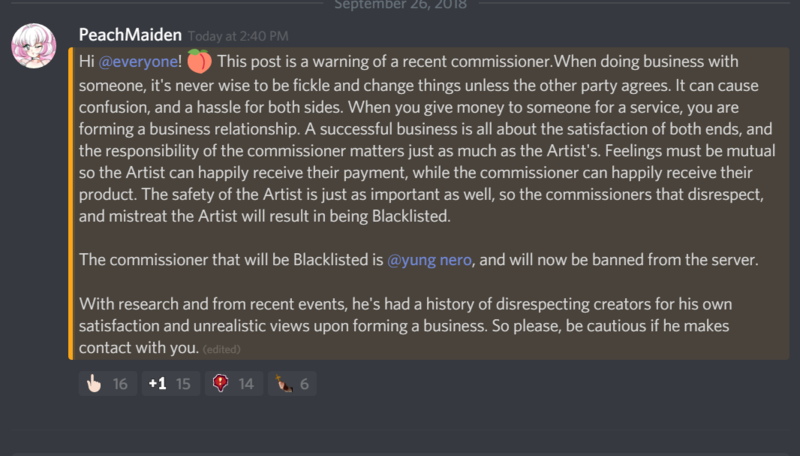 The commissioner that will be Blacklisted is @yung nero, and will now be banned from the server. With research and from recent events, he's had a history of disrespecting creators for his own satisfaction and unrealistic views upon forming a business. So please, be cautious if he makes contact with you." This post makes me feel like 1) she told her mods false information about me to slander me ("With research and from recent events, he's had a history of disrespecting creators for his own satisfaction and unrealistic views upon forming a business" despite the fact that said research and history doesn't exist) and 2) it feels like an attempt to sweep everything under the rug. This could prove problematic in the future, as if there are any artists that accept commissions in her server, that could potentially prevent me from trying to commission other artists in the future. EDIT: PayPal denied the chargeback request. She got away with murder, ggs. 1. "No refunds" is unenforceable. You can't keep money for work not done, and Paypal won't let an artist keep money for doing nothing. 2. Holding the amount of time it took to communicate with you over your head is unprofessional. She knew this was going to require time working with you, and should have charged you accordingly. 3. That ref sheet is at most 50% done, so imo she owes you a %50 refund. This is my opinion as an artist. It isn't your fault she took a long time on it. If she wanted to distribute the refund (or guilt you about it) by the hour, then she should have charged by the hour. 4. That mod message is completely unwarranted. This was a ref sheet commission. The changes you asked for are not out of line for something that is work-intensive as a ref sheet commission. 5. While it's not entirely unheard of to take on new work while a large project sits in queue, she should have been taking the initiative to contact you. There's no excuse for that. I'm not sure if I covered all of my feelings reading this yet. On Twitter, the artist , myself, and a third party have talked it out, and as such, I feel that the post is deserving of the "resolved" tag. As a note to other members: Please don't post the OP's real life name here. Edit: Here are the relevant pages. I've highlighted some super shady terms. The refund clarifications she's added to her TOS are just unworkable and unenforceable as Celestinaketzia has already stated - and posting your real name without your consent is just so so gross. I'm sorry you had to go through this experience but thank you for the warning OP - will definitely avoid. Personally when I have had to cancel work because of my own reasons I have given a full refund and have taken responsibility for the losses myself - from my perspective the client paid for a certain level of work and me deciding what they pay for a different form of commission (for example, if they've paid for a full colour and I only provide a sketch) is not okay. Obviously if the client cancels then that's different but I guess I disagree that the artist should be able to cancel and charge the client for a form of work they didn't choose to buy. What are other people's thoughts? It's always been the general consensus in furry at least that if the artist cancels the client gets a full refund. I'm not sure how other fandoms handle it, but imo it's just good business. If I cancel my customers commission, even if Im 90% finished, full refund. (Baring them being actually harassing, like if they start threatening me or throwing slurs around at me) And even then, it's usually full just to get them away from me. Just because a client are patient does not mean that they should be pushed back on the list and then add clients real name on a black list. Nope! This is being screened because the twitter portions are unrelated to any transaction. Quite frankly it's not the community's concern. If you would like to repost the segments about Edalie you are more than welcome to. However, please bear in mind that any poor behavior on behalf of the client doesn't negate the fact that the they are still owed a proper refund for work not done. Also please watch the number of edits that you do as moderators are emailed for every comment and edit to a comment. It becomes very spammy very quickly. 1) I already posted the full chatlogs between the artist and I in my post above. I don't see why a short version with less details (including having all of her responses removed???) needed to be reposted. 2) My Twitter account is not linked anywhere in the post, and nowhere on my profile. To make matters more confusing, the example linked is over a month old. Assuming the artist linked my Twitter account somewhere on her discord (which she probably did, considering she also posted my real name without my prior knowledge or consent) why would you feel the need to browse my personal accounts looking for dirt on me? How I talk to people I'm not commissioning, nor do I have any intention to commission, is none of your business. 3) I really don't know how this whole "history of being abusive towards other artists" thing came about, because the only other commissions I have had done were via email, and I can almost guarantee that details on those are scarce as I doubt that Edalie has contacts with R34 artists or Instagram cosplayers, Even if she did, I go out of my way to be courteous to people I'm giving money to, so there wouldn't be any issues. EDIT: made a few changes to tighten up my points. Why i'm not surprised the artist supporters are showing up here defending the artists support of theft and doxing the customer real name. This is really not helping the artist case but only confirming the beware more. It's usually how it goes, unfortunately. When individuals don't bother to come in, but cosign a whightknight to do so it doesn't look very good for them. Thankfully this appears to be resolved, but it seems to be a shame that Edalie sees nothing wrong with her ToS/ keeping the full amount if she cancels.